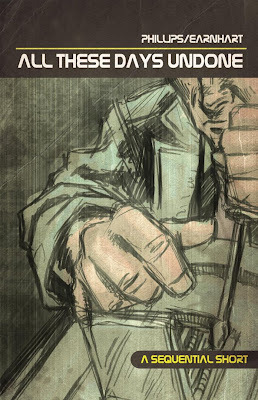 I just wanted to give everybody a heads up to check out a couple of neat short stories written by Hudson Phillips and drawn by Brandon Earnhart. "All These Days Undone" is a nifty 7-page story that nicely meshes "don't choose work over family" with "don't mess with time travel." 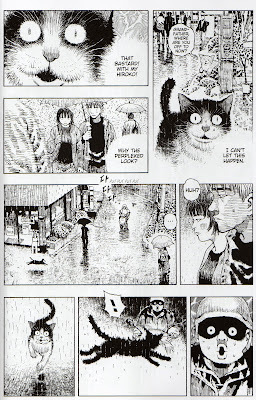 "Strawberries" is another 7-pager with some hot tiger action. I enjoyed both stories and encourage you to check them out. Hot damn what a book! 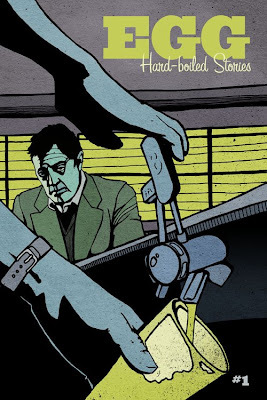 In what is rapidly becoming a banner year for comic books of the crime/noir/mystery persuasion (see, for instance, Britten and Brulightly, the finale of 100 Bullets, the ongoing amazingness of Scalped, Vertigo's new crime imprint, the upcoming Noir anthology and return of Brubaker and Phillips to Criminal, and hey -- even Marvel has gotten into the act with noir versions of its established super-hero properties), Richard Stark's Parker: The Hunter is likely to be crowned as the champ. It's an artistic tour de force. The story, based on a book by Richard Stark/Donald Westlake, is about a betrayed man exacting his revenge on his betrayers. Except for a flashback that shows us just how he was betrayed, the book takes place in New York City, in 1962. Parker is an independent criminal unaffiliated with organized crime, but his anger-fueled mission seemingly sweeps in just about every lowlife in the five boroughs. Pretty much everybody you meet in the pages of this story will end up getting theirs. 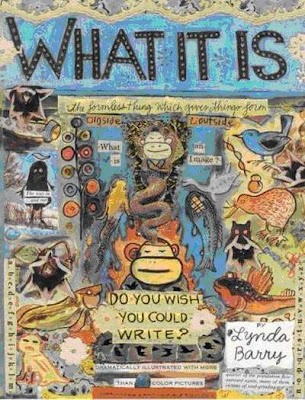 Along the way the book throws in action, drama, and some nice black humor. 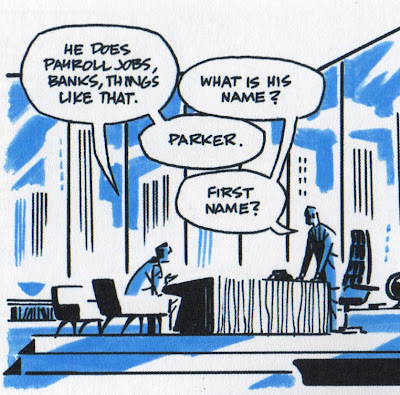 Part of the fun of the book is watching Parker go about his business. Parker is one bad dude. I'm not just talking about how he's tough, resourceful, and seemingly unstoppable. He's also a hardened criminal who isn't above theft, murder, and whatever else it takes to get what he wants. He's almost like a more stealthy and cunning Terminator. 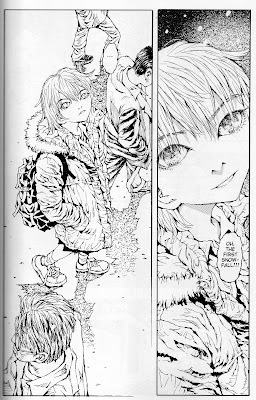 You still root for him, because the other bad guys have no redeeming qualities whatsoever, but he's certainly not your typical hero. 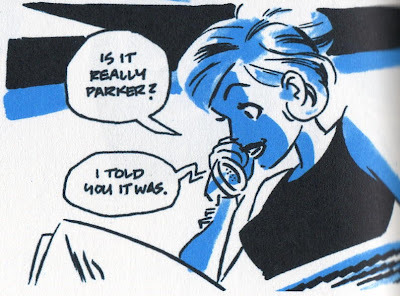 While Parker is captivating and the plot is a blast, the art is truly exceptional. 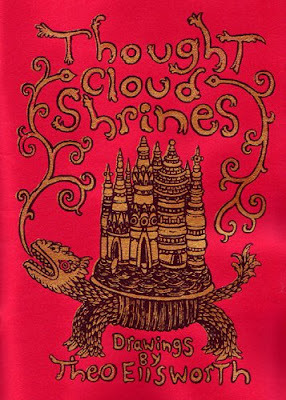 Cooke's drawings are so fluid and the storytelling is so strong that you might zip through this book at a frenetic pace. I'd recommend forcing yourself to slow down (or go back through it once you're done), however, and really look at these images. 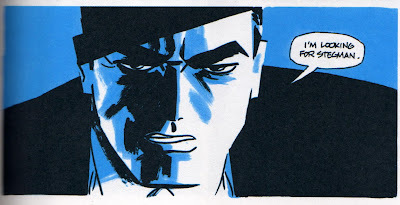 There's such style and grace on display, and Cooke's line is so confident that it feels like he drew the entire thing without once picking up an eraser (rubber or digital). But it doesn't feel dashed off; it's more like he just knows the perfect place to put each mark and executes it with precision. And Cooke's done his research -- the backgrounds, hairstyles, clothing, furniture, all of it looks fabulous and just so 1962. It's just fantastic. 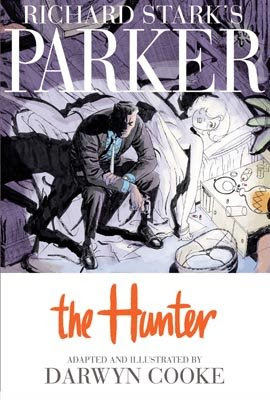 This is only the first of four planned comic books by Cooke about Parker, which means that there is a whole lot of awesomeness lined up. Get on board now. DID YOU KNOW? The 1999 Mel Gibson movie Payback also was based on The Hunter. I always kinda dug it, but I got the feeling that nobody else did. I'm guessing I won't be the only one who likes Cooke's version, however. RELATED: Here's my review of Jonah Hex #33, with art by Cooke. 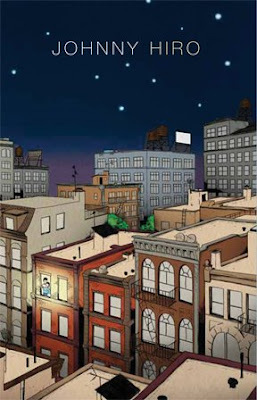 This manhwa, or Korean comic book, is a collection of eight sad short stories set in gloomy cities about gloomy people. It's not a ton of fun, but it certainly is an interesting book. Interestingly, the book includes a review at the back that is not entirely glowing. 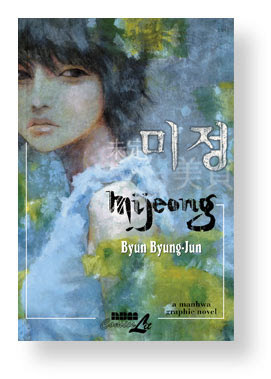 At one point the reviewer notes that the stories contain "a lack of plot twists that might captivate the reader . . . ." But the reviewer ends by stating that it "will be interesting to see in which direction the next work by Byun Byung Jun evolves . . . ."
I'd agree with that last statement. It's clear that Byun Byung-Jun is an artist with potential, he just needs to find something to say. I'll certainly be on the lookout for his next book. READ MORE: Here is a seven-page preview and a fourteen-page preview. This Mignola guy might be on to something, here. Hellboy: The Conqueror Worm was a four-issue mini-series originally published in 2001, and it is another solid entry in the Hellboy series. The Bureau of Paranormal Research and Defense sends Hellboy and another operative, Roger the Homunculus, into the mountains of Austria to investigate a castle linked to a 1939 Nazi space program. Modern-day Nazis, a Frankenstein's monster-like ape, a floating head, and other assorted ghosts and ghouls await them. By now, Mignola has his formula worked out (1. Hellboy investigates creepy location filled with humans stupidly trying to control/summon evil entities; 2. Hellboy punches evil entities), but it's a formula that works. He invests enough imagination into the proceedings to make the bad guys seem really bad (and dangerous) and action lively. And Hellboy himself is a great character, using humor, intelligence, and his fists to overcome difficult situations. That first page is an excellent example of how Mignola builds suspense and dread. What's up there? We don't know yet, but there's a freaking talking skull warning us not to look. Even after Hellboy sticks his head up, the reader's view is still trapped staring at Hellboy, so we don't know until we turn the page. And then on the second page, some powerful hits are delivered by the ape; you can feel them. 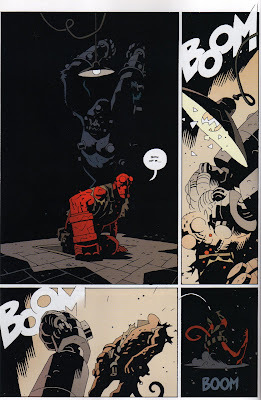 I really like the panel in the top right corner, where the ape's hands have swung right through the lamp and down onto Hellboy; it's a neat choice by Mignola. I really liked this one. I expect most comic book readers have already read Hellboy or decided it's not for them, but for those of you on the fence, go check it out. DID YOU KNOW? 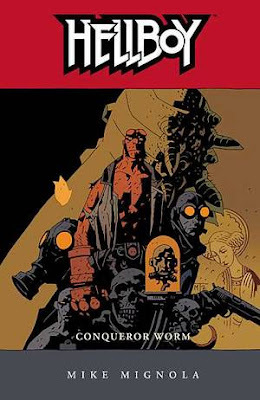 Hellboy: The Conqueror Worm won the 2002 Eisner Award for Best Finite Series/Limited Series. READ MORE: Here's a six-page preview. 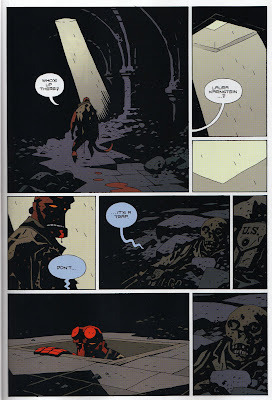 And here's a list of online Hellboy comics (some are pretty neat little animated things -- check 'em out). a pretty strong faction of folks associated with the Big Two think that the Marvel and DC Sales Charts are gradually killing periodical sales . . . . I wanted to make sure that running an Indie Sales Chart wasn’t going to strangle a bunch of titles in their crib. Really? Sales charts published on the Beat are gradually killing periodical sales? I guess the idea is that people never like buy a book that isn't selling like gangbusters because they know it will fade away quickly, but do the sales charts really hold that much sway over the buying public? 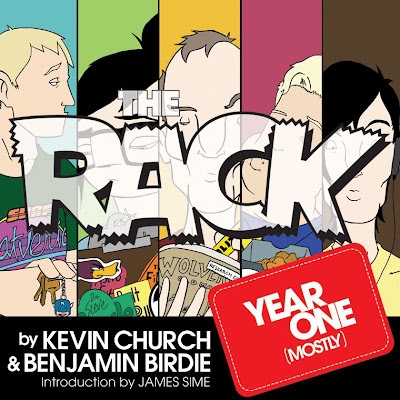 In any event, I've often thought that the sales charts on the Beat might make a person who cares about periodical comic book sales depressed, since after those first few big-selling titles, the chart is basically a list of book after book that is slowly losing sales on a month-to-month basis, and the bottom third of the chart tends to be books with teeny-tiny sales that aren't long for this world. Here's my grand, thinking-outside-the-box suggestion to help people feel better: Reverse the order of the sales charts so that the lowest-selling books comes first, counting down to the top-selling books. I think this change will make people feel happier about the charts, because it will place more importance on the top-sellers and because the top-selling books will be the last thing that people read about, so they'll finish reading and feel good. Maybe then they'll go out and buy those floppy comics 'cause they feel so optimistic about the state of the industry. I think comic book publishers should release more comic books on a weekly, rather than monthly basis. And I'm not talking about doing more year-long series like 52, Countdown, and Trinity. Instead, I think the big-time summer crossover mini-series like Secret Invasion and Final Crisis should be released on a weekly basis. This change would address two of the biggest complaints that I've read about the summer crossovers. First, it would fix pacing problems. 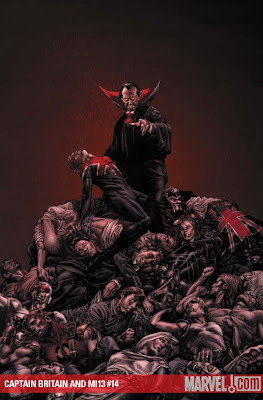 Secret Invasion was criticized for moving very slowly through a very simple plot. If it came out on a weekly basis, people wouldn't have to wait very long for the next installment and the plot would feel like it's moving along at a faster pace. Second, it would fix the problem that occurs when the big events for a comic book universe all have to happen in the main mini-series, forcing all of the other books to wait until those events happen. Now, the other books wouldn't need to tread water for months. Finally, I think it just makes more sense to have the "summer crossover" mini-series begin AND end in the summer, rather than begin with a bang in the summer and end with a whimper in the dead of winter. In addition to mini-series, this might work for ongoing comic books, with a series running more like TV seasons: a bunch of issues in a row, followed by a pre-determined break period (along with a release of a collected edition of those issues). This might help certain books build buzz so that when they return for their next "season" they've picked up new readers. 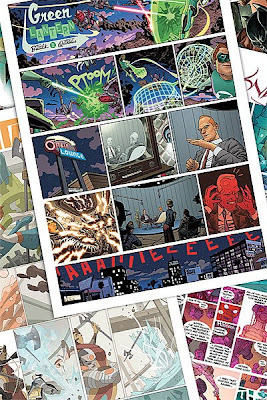 I think many people assume that, like newspapers, magazines, and books, paper comics will eventually be replaced by digital comics; the only real question is how quickly it will happen. I'd like to suggest that the digital revolution will take longer than most people believe, for the simple reason that comic books are composed of both words and pictures. While literature is certainly making the jump from print to digital, I think that the transition will be much slower for fine, visual art. The method of presenting words on a page matters much less than the method of presenting a piece of art. Don't forget that comics are both literature and art, which I think means that paper comics will be around for a while yet. 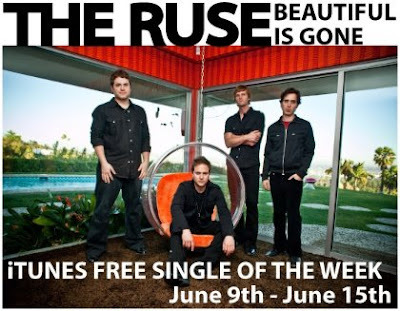 A song by my brother's band The Ruse is the iTunes free single of the week! Please check it out, and feel free to send this link to EVERYONE THAT YOU HAVE EVER KNOWN, ever. I had a great time at the MoCCA Festival 2009. There were wonderful, beautiful books on display in the main hall of the Lexington Avenue Armory, but the high point for me was getting the chance to meet many of the people who populate the comics world. I talked to a raft of comic book creators, including Scott Campbell, Lilli Carré, David Malki, Kate Beaton, and Molly Crabapple. I wandered around the hall for a while with Matt Brady, and I got to talk very briefly with Heidi MacDonald and Tucker and Nina Stone. Will the economic crisis turn comic creator against comic creator? 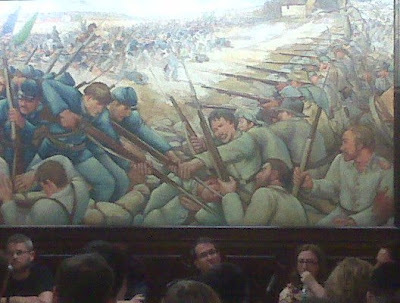 and a bunch of dudes with bayonets. 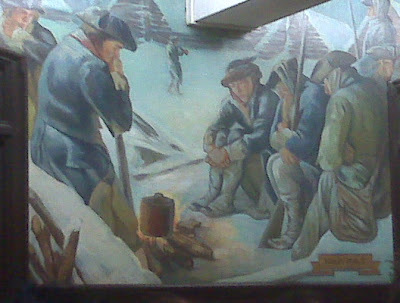 Did you know that Valley Forge was cold? But hey, I also bought some things! 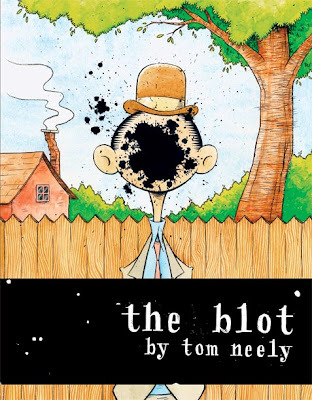 I'd been wanting to get my hand's on Neely's self-published book for a couple of years, and he drew a neat little sketch in the back of it for me. 1. 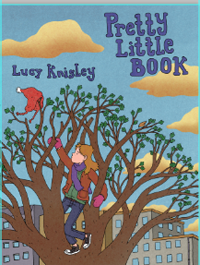 What other books would you put on the short list for "comic book of the year"? I think the race is shaping up nicely, with Asterios Polyp, The Photographer, and A Drifting Life all in contention and more heavy hitters on their way, like Osamu Tezuka's Swallowing the Earth, Robert Crumb's Book of Genesis, and Bryan Talbot's Grandville. That's a pretty impressive list of books. 2. Could 2009 be the best year for comic books ever? In addition to those six books I mentioned above, this year will see a glut of other incredible work published before it is over. How does the total output match up with other great years for comic books? This book looks like a lot of fun, and Fred Chao even seemed to recognize my blog's name, which is always a plus. 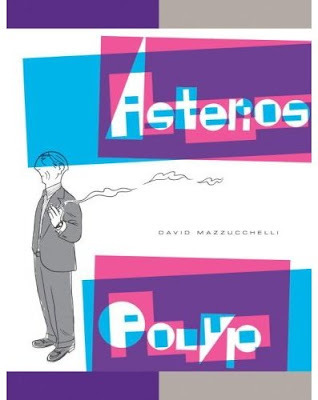 He also mooned over my copy of Asterios Polyp. I'm very glad that I got to meet Kevin and Benjamin in person and pick up the first collection of their web comic. I really like Knisley's colored work. I got this instead of her awesome zombie poster, because I have children at home and can't really put something like that up on the wall. But that poster is great. I have no idea what this is about, but I'm a sucker for crime comics. I think Ellsworth's drawings are fascinating, so I grabbed this 28-page collection. That's it for my haul. As happened at SPX, I was pretty overwhelmed by the amount of incredible stuff available, and I could have spent many, many hundreds of dollars. But I think I came away with some great stuff, so I'm happy. Finally, I'd like to thank my wife for watching the kids so that I could go and look at comic books all day. You rock. RELATED: I wrote about my trip to SPX 2008. The video was shot and edited by Steven Greenstreet from America.gov, who was nice enough to tell me about it. engages international audiences on issues of foreign policy, society and values to help create an environment receptive to U.S. national interests. So it's basically America's propaganda unit. Hey -- if we're showing off America's good side by making documentaries about comic books, I'm all for it.